Vijayadashami, or Dasara, celebrated on the day after nine-day Navratri festival is observed as Vidyarambham in Kerala and is dedicated to Goddess Saraswati – the Hindu Goddess of learning. Vidyarambham 2019 date is October 8. ‘Vidya’ means knowledge and ‘Arambham’ means to begin. Children above the age of 3 usually take Vidyarambham on the day. On the Vidyarambham day, young children are introduced into the world of alphabets or letters and they take the first step into the world of knowledge. Today, there is no rule regarding the age of child for Vidyarambham. The preferred age is 3 years. But children who want to put their child in the rat race quickly even perform at the age of 2 and 2.5 years. In ancient Kerala, Vidyarambham was performed for both girls and boys when they reached the age of 7. (Encyclopaedia Indica: Malabar - Page 287 by Shyam Singh Shashi) (Society in Medieval Malabar: A Study Based on Vadakkan Pattukal - page 52 - Kuzhippalli Skaria Mathew). The Vidyarambham festival is a unique annual event held in Kerala on the Vijayadashami day. This initiation of children into the world of learning is performed by parents, grandparents, elders, writers, teachers and other renowned personalities associated with literature. They adorn the role of Guru to the children. Today some leading newspapers in Kerala have made Vidyarambham into a festival (business to increase circulation). They register children in advance and you can have the ceremony performed by your favorite writer, poet, musician, actor or politician. Some people prefer to conduct it in a temple and the most famous temples are Kollur Mookambika Temple in Karnataka and Panachikkadu Saraswathi Temple. The children sit on the lap of the guru and the guru writes ‘Hari Shree’ on the child’s tongue with a golden ring. Then, the child writes ‘Hari Shree Ganapathaye Namaha’ in Malayalam with the right index finger, with the help of the Guru, on a bed of raw rice. The Vidyarambham ceremony is a major event at the Thunchan Parambu, dedicated to Thunchath Ezhuthachan, who is considered as the Father of the Malayalam language. Thousands of children partake in the initiation ceremony here and it is a great sight to watch the young children entering to the world of knowledge – some highly enthusiastic, some crying, some adamant and some curious. The ceremony is also conducted by publishing houses, newspapers and other social and religious organizations. Students keep their books for puja; workers, mechanics, craftsmen, engineers and all people who make living with tools and other implements perform Saraswati pooja. On the Ayudha Puja day (the day before Vijayadashami, the books and tools are not touched. The pooja is broken and the books and tools are taken on the Vidyarambham day. 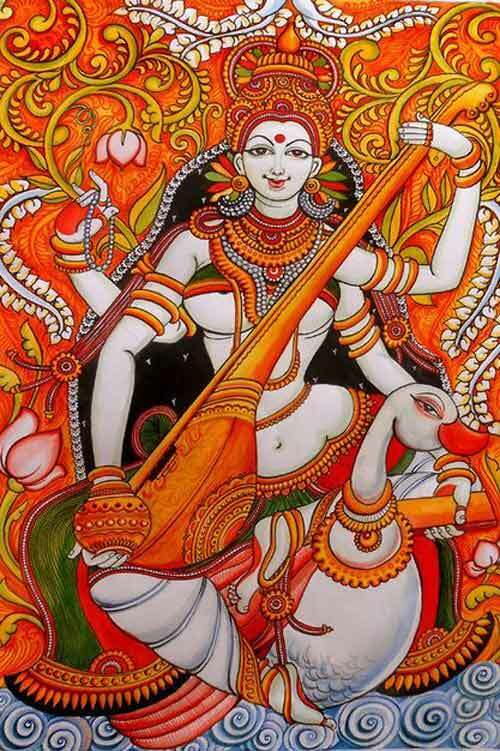 Unlike in other parts of India, the nine-day Navratri festival and the 10th day of Vijayadashami day is mainly dedicated to Goddess Saraswati in Kerala.